When starting up BC-Wedge, sometimes you may get an error that notifies you BC-Wedge is already running. 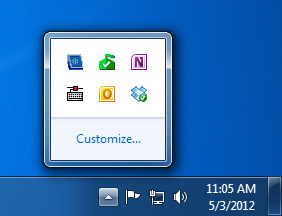 However, when looking at your task bar, you might not see a BC-Wedge icon. To avoid cluttering the user's task bar, BC-Wedge was instead designed to minimize to the system tray. This allows BC-Wedge to run discreetly in the background. First, realize that this error does not imply that BC-Wedge isn't working. In fact, it means that BC-Wedge is already activated and ready to accept data. BC-Wedge is already started and there is no need to "re-start" it. To either shut down or modify the BC-Wedge settings, please go to the bottom right of your computer screen in the system tray area of the task bar (see screenshot below). If the BC-Wedge icon is not displayed next to the clock, look for an upward pointing arrow. Upon hovering over this arrow, the text "Show hidden icons" will appear. Please click on this arrow to show all of the hidden icons. The BC-Wedge icon should now be visible. Right click on it and select "Open BC-Wedge." Now the main BC-Wedge screen will pop-up and you may modify any BC-Wedge settings or properly close out of BC-Wedge by using the "X" button on the top right or clicking File > Exit.